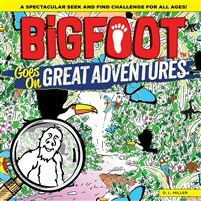 Sharpen your search and find skills by locating BigFoot as he searches the world for adventure. Find the elusive creature and his legendary footprint - along with over 500 other hidden objects - in 10 immense visual puzzles, full of teeming activity and detail. Learn more about what you see with fun facts and pictures! As with Bigfoot, D.L. Miller is a bit on the reclusive side, rarely seen in public, spending most of his days sketching from his studio located amongst the mighty oak trees only found in the deep dark woodlands far off the beaten path. After spending decades learning the habits of the elusive bipedal humanoid, he has finally agreed to share his illustrative journals that capture the sightings of this larger-than-life creature that has mystified generations.